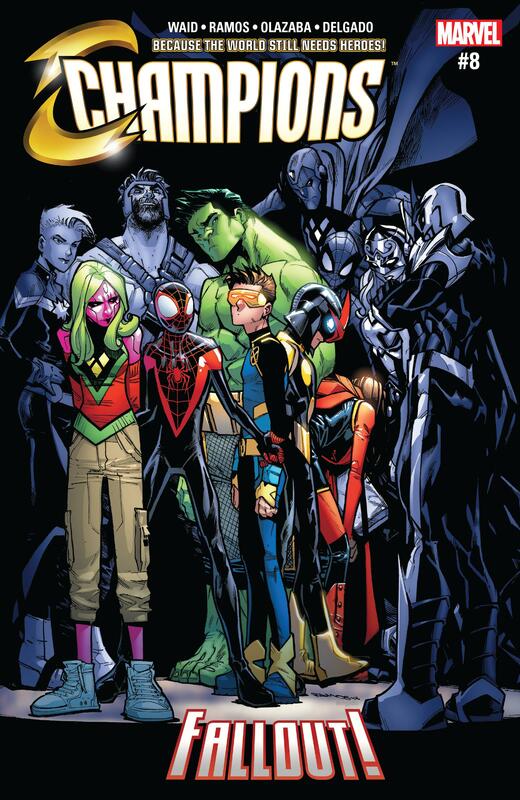 Story: In Champions #8, our heroes are dealing with real life corruption at the hands of branding and media. I like the angle this story is taking with this, because it’s relevant to the age that we live in. Everyone gets their information through social media, often times even our major news networks. The Champions started the hashtag and took on a major following. However, without the appropriate copyright, anyone is able to take that name up and do what they like with it. In this case, that means profiting and tarnishing all at the same time. This is bad news for the teenage heroes, and the kind of villainy that likely would never have seen coming. There’s kind of a hard balance in this book for Ms. Marvel’s personality. There’s some points where I don’t agree with her anger. But then when I think for a moment, I realize that that anger comes from passion, and its actually rather fitting. Everything she’s done with the Champions up to this point is fitting with her character. Save for her missing some of her more defining traits in her own book, her ideals are very strong in this one, and the antagonists are doing well with ripping that apart. The character dynamics concerning Viv are something else worthy of discussion. Androids, or synthezoids as she may be more aptly called, are interesting. From what I know about Vivian from reading the Vision series, I find that because she was able to grow and learn, she was also able to develop feelings and emotions more thoroughly than Vision himself. Combine that with her “literal” attitude and you get some fun conversation. I also notice how she let on that she is likely a queer synthezoid, which is even more interesting. Then Vision at the end grounding her inspired more thoughts about android dynamics. Perhaps I’m really just itching for another Vision series? In any case, Cho and Scott have a “Fastball Special” moment, and sort of discuss their lack of tolerance for each other, and find out that they don’t hate each other as much as they thought they did. 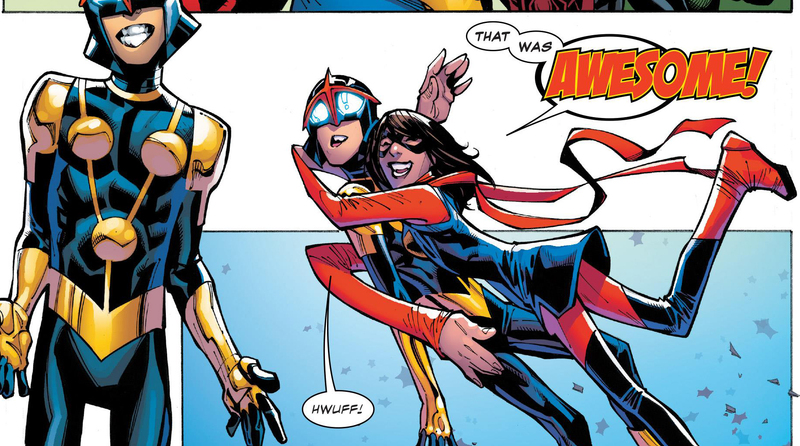 Also, after Ms. Marvel finds out that Nova saved their movement (because it is in fact, not a brand), she clamped to him for what was pretty much the rest of the issue repeating “I Love You!” more times than Groot says his own name. It wasn’t a real profession of love, but sort of a cute foreshadowing. I kind of felt like they were moving towards each other in the previous Avengers book (though Nova was being written as far too much of a self-righteous idiot there in my opinion), so it would be nice to see them end up together. Art: So, before I again gush over how much I love Humberto Ramos I’d also like to comment on the theme of the single splash page at the beginning of every issue and how it kind of gives us a moment to analyze what the book might cover before we even get into it. Not only doesn’t this splash represent “branding” well, like all the others, it’s incredibly detailed and it’s always a beauty to look at. I also really enjoy this cover. The theme of putting the Champions in the spotlight with potential antagonists in the shadow is fun. This time those being adult supers who give us the mind that that some parental-esque (and actual parental in Viv’s case) scolding is about to take place. The downcast expressions suggest them taking the chiding with humble hearts. I enjoy this cover more than the last, and the art on the pages is as always superb, and I think perfect for this team book. Verdict: This was a fun team cohesion and character development issue. I think it’s important for a book to dial down from the craziness of combat and major issues all the time, and just focus on the characters, and I like that this one does this, even down to the hook being that Vivian is grounded. It’s pure fun. I love every character on this team and they serve each other well. I hope to see more character development like this in the future. They are primed to start a new arc, so let’s see what comes next. Hulu Orders Runaways To Series, First Trailer Footage Is Found! 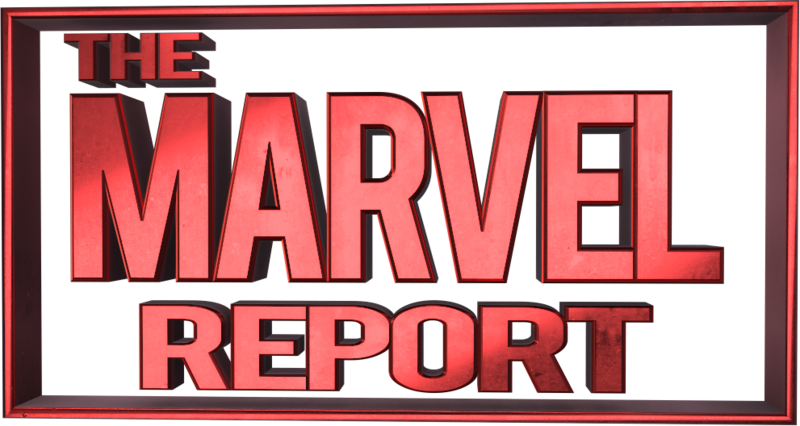 Marvel Comics’ Iceman Creators & More Revealed!